Update 2/21: Adding power consumption figures for the PM1643 drive, new features. Samsung this week announced that it has started mass production of its PM1643-series SSDs. These are monstrous data storage devices, with up to 30.72 TB capacity each. 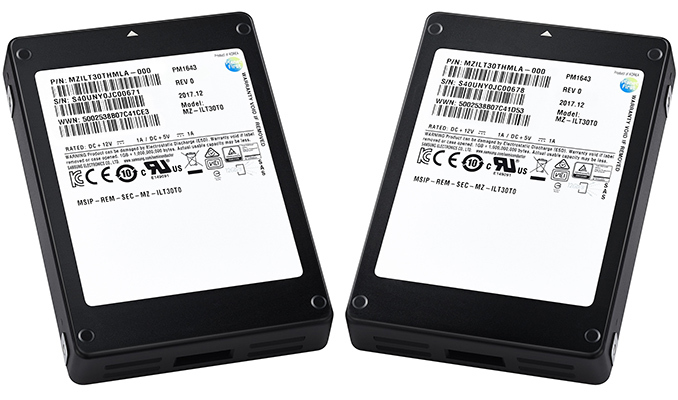 The new drives use Samsung’s 64-layer 512Gb TLC V-NAND memory chips stacked in 1 TB packages. Later this year Samsung plans to expand the PM1643 lineup with SSDs featuring other capacities. Samsung’s PM1643 30.72 TB SSD is the company’s highest-capacity mass-produced drive to date. It is designed primarily for read-intensive workloads, and features an SAS-12 Gbps interface. Samsung rates its PM1643 for one DWPD (drive write per day) throughout five years, which indicates a very high endurance of roughly 56 PB for the drive. The choice of the interface and robust endurance rating naturally suggest that we are dealing with a drive for mission-/business-critical applications. Some of the features of the PM1643 that Samsung is willing to discuss right now (metadata protection, power loss protection, data recovery, end-to-end data protection, encryption, etc.) confirm that the drives are indeed aimed at servers that require advanced reliability. The PM1643 is based on Samsung’s proprietary controller architecture as well as 512 Gb 64-layer TLC V-NAND memory chips - 16 of them are stacked together to create 1 TB packages, over 40 of such packages are used for the 30.72 TB drive, giving sizeable overprovisioning. The new SSDs also carry 40 GB of stacked DDR4 memory (8 Gb DRAM chips interconnected using TSVs), which is in line with the configurations of other drives. When compared to the previous-generation PM1633a SSDs released in 2016, the new PM1643 offers both double the capacity and also considerably on-paper higher performance. Samsung claims that the PM1643 30.72 TB SSD features sustained sequential read and write speeds of up to 2100 MB/s and 1700 MB/s, respectively. As for peak random read/write performance, the new PM1643 drive is rated for sustained 400K and 50K IOPS, respectively. Samsung yet has to announce sustained sequential and random performance numbers, but it is clear that the new SSDs are intended faster than their direct predecessors. Update 2/27: The performance numbers disclosed by Samsung indicate sustained, not peak performance. The Samsung PM1643 SSDs will come in a 2.5-inch form factor, but at 15mm. The new drives support configurable run-time power consumption options of 9W ~ 13.5W (the lower consumption means lower performance), which allows to choose between power and performance per system and application. Since the drives consume an exact same amount of power as the PM1633a 15.36 TB, it is drop in compatible with systems that use the PM1633-series drives. Furthermore, GB-per-Watt consumption of the new drives is at least two times lower when compared to the PM1633a 15.36 TB model. Sequential Write 1700 MB/s ? Samsung started mass production of its PM1643 SSDs in January and has already shipped the first batch to an undisclosed customer. Pricing of individual 30.72 TB drives remains unknown, but we expect it to be thousands of dollars per unit, even at bulk. 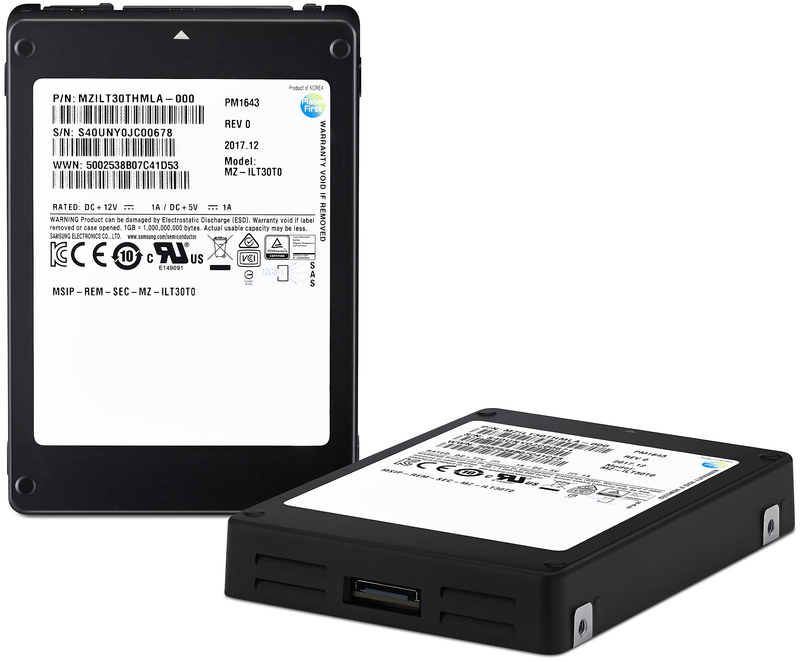 Later this year Samsung plans to introduce additional capacity points to the PM1643 lineup: the family will include drives featuring 15.36 TB, 7.68 TB, 3.84 TB, 1.92 TB, 960 GB and 800 GB of usable NAND flash. Over, easy. You'll get to $8k on just the combined price of 16 2TB Crucial MX500 drives. All that combined, with a SAS connection at like 1/4 the height? I'll take the over as well. We spend about $2,500 for 1.92TB read intensive drives for our vSAN environment now. This drive is 16x the capacity which works out to $40,000 for same number of drives to get the same capacity. If this drive is even $30,000 it's a bargain compared to current offerings particularly considering the performance numbers. To think about multiple disk groups of 3.84 write intensive cache drives in front of two 30.72 capacity drives in a hyperconverged environment with significant cost savings over what we can do currently. I could eliminate all other storage in my data center. Anything under $40,000 is amazing. I'd take one for fifty bucks. I don't think Samsung's really thought this through. Most home users don't have SAS controllers, and add-on cards are SO 1999. ...and 40GB of DDR4 (presumably ECC) alone is half a grand.